With the kids getting older, we are always making sure that we have the right car seat for the right kid for the right height, the right weight, and the age. As parents, we all understand the importance of the car seat. The car seat is one of the most important parts if a crash is to happen and the only in between your child and impact. While we have never had to worry, it is important to make sure all kids have the right car seat. With Brooklin getting older and bigger, we got rid of her old forward facing car seat with the locking harness buckle and are replacing it with a booster seat. We were provided with the Graco AFFIX™ Youth Booster Seat with Latch System to test out and it has been a good seat for moving up. With its head support for side to side movement and its bolstered seats, it is a very secure seat and can grow with the kids. Plus it separates to allow for just the use of the base which is great for bigger kids. The American Academy of Pediatrics recommends children 4 feet 9 inches tall or under should use a belt-positioning booster seat. Booster seat with high back (left) and with only base. We have a few reasons we like it. The first is how it separates the top half from the sitting base. We decided to let the Brooklin get Kaila’s old seat and give Kaila the choice of having a seat to give her lower back and bottom support, but without the bulky backing of her old booster seat that is a complete seat, top and bottom. By her just using the base, it gives her more room for the longer trips and gives her more safety than just a big seat. It Is easy to remove the back from the base, which also makes it easy for moving it between cars, which is good for when the kids go with family. 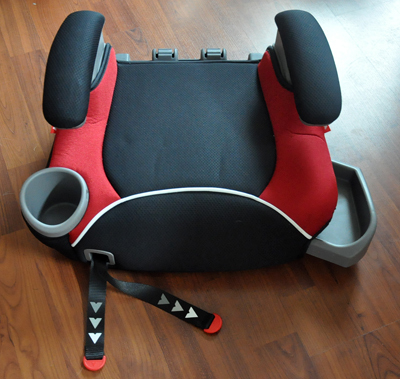 Other features include the easy to adjust front strap belt that allows you to tighten and loosen the booster seat from the vehicle seat using the factory vehicle anchor points, for added safety. It also has a small sliding compartment for storage and of course a drink holder. It will be easy to clean with a machine washable cushion. It is recommended to use the highback for 30 – 100 lbs children, 38 – 57 inches tall. And use just the base for children 40 – 100 lbs and 40 – 57 inches tall. The American Academy of Pediatrics recommends children 4 feet 9 inches tall or under should use a belt-positioning booster seat. From now until March 24th Graco Baby is running a Bumps in Action Facebook contest. One lucky grand prize winner will win a Graco FastAction Fold Jogger Click Connect Travel System, a $5,000 scholarship for baby, a one-year gym membership and a consultation with a personal trainer. And 10 runners-up will win a FastAction Fold Jogger Click Connect stroller. For a chance to win moms and moms to be are encouraged to visit the Graco Baby Facebook page and share a photo of them in action with their baby bump or with their baby. Great post! I also think this is an excellent seat. I did want to point out that the picture with the child in the high back booster is not using it properly. The belt should be through the shoulder belt guide and over the child’s shoulder. It should lay flat between the shoulder and the neck and over the collar bone. The lap portion is also not routed properly. It needs to be under the arm rest completely. The head wings should be raised up probably two clicks so that the bottom of them are even with the child jaw line.